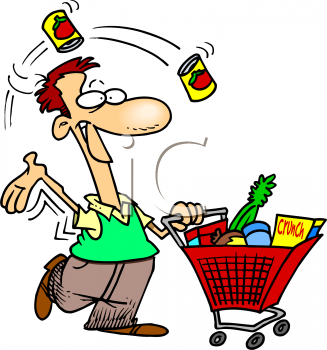 Picture this – you’re at your favorite grocery store and you can’t help but notice – no matter which aisle you’re in, you’re actions are being observed surreptitiously by a herd of people. Each one carries a clipboard, in order to keep track of everything you throw into your grocery cart. On top of that, every grocery product you look at is noted and written down. Sound a little farfetched? Alright, then try this – you’re cruising on CNET’s (download.com) Windows home page, and your every action is being observed – every action you take, every motion you make, is noted and written down. Sound a little farfetched? While the first scenario is just my imagination in overdrive, the second certainly isn’t. If you had Ghostery, the Firefox and Chrome add-on (which is designed to protect your privacy, by identifying who’s tracking your browsing) installed, you’d have access to the following information. Screen shot of the trackers on CNET’s Windows home page. 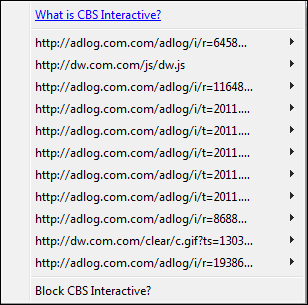 Screen shot of the CBS Interactive individual links. I’m not focusing on CNET particularly – you can expect to encounter this type of tracking on virtually every Web site you visit. This intrusive behavior is common, and should be expected. It shouldn’t be common, but with little resistance being offered by the “sheeple”, and a failure by regulatory authorities to enact appropriate consumer protection laws, we can expect privacy intrusions , like this, to accelerate. How sad is that? If you object to this type of intrusion into your privacy, then consider installing Ghostery, and give these intrusive jerks the heave-ho. It may not be a perfect solution but, it’s a step in the right direction. DETECT – Ghostery sees the “invisible” web, detecting trackers, web bugs, pixels, and beacons placed on web pages by Facebook, Google Analytics, and over 400 other ad networks, behavioral data providers, web publishers – all companies interested in your activity. CONTROL – Ghostery allows you to block scripts from companies that you don’t trust, delete local shared objects, and even block images and iframes. Download for Firefox at: Mozilla. Download for Chrome at: – Google. Cool~.. I never heard about this before.. thanks for this information. One more tool we can use in the never-ending battle against snooping web sites. I use this little ”tool” about a year and it does its job successfully. Best regards and Happy Easter ! Thanks – and you too – Have a safe and relaxing Easter. I’ve used it for a while. I like it, but it seems to slow down FFX. I’ve had Ghostery installed for quite a while now, I would feel naked without it. A great addon and works terrific.